No man is an island — and no communications professional can stay on top of the game without a little help from the field’s vast array of blogs, reports, databases, associations and other resources. Keep your work in nonprofit arts marketing cutting-edge by backing up your goals with the tools we’ve compiled here. If you’ve got a favorite resource that’s not listed below, please let us know about it in the comments! The Arts and Business Council of Greater Philadelphia, itself a resource for the local arts sector, has compiled a comprehensive list of regional arts service organizations. Regional marketing organizations listed include Avenue of the Arts, Inc., and PhillyFunGuide.com. Philadelphia’s former Chief Cultural Officer Gary Steuer’s blog may have moved with him to Denver, but he continues to speak on topics that are nationally relevant for the industry. The City of Philadelphia’s Office of Arts, Culture and Creative Economy maintains its blog Creative Philadelphia with City Hall-centric arts announcements. A section of the American Association of Museums’ resource library is dedicated to marketing and public relations. Content is restricted to members only. 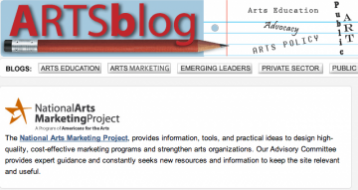 Beyond posting its own research data, a section of Americans for the Arts’ ARTSblog focuses on arts marketing, in association with its program the National Arts Marketing Project (NAMP). The NAMP hosts an annual conference, issues a bimonthly newsletter and covers arts marketing and technology trends in a monthly podcast. Public Relations Society of America (PRSA): Even nonmembers can access articles on the website and from its monthly newsletter, Public Relations Tactics. Resources from the national PRSA nonprofit section are members-only. PRSA Philly, the local chapter, posts its monthly newsletter articles online and hosts regular networking events. The American Marketing Association has a Nonprofit Marketing section with its own conference, and the Philadelphia chapter holds regular events on topics like email marketing. Its resource library can be narrowed to nonprofit marketing articles, but the few in its database appear to be sponsored content. The Greater Philadelphia Cultural Alliance (the Alliance) posts its reports on the sector’s economic impact and regional cultural engagement here. Pew Charitable Trusts posts its audience engagement research completed in partnership with the Alliance online. Visit Philadelphia (formerly the Greater Philadelphia Tourism and Marketing Corporation) provides its reports on regional visitor statistics and tourism industry impact. Look for marketing reports from leading institutions, like “Marketing Exhibitions: Will They Come?” or “Audience Building: Marketing Art Museums,” published by the Smithsonian’s Office of Policy and Analysis. You’ll find intermittent audience engagement and arts marketing workshops from the Pew Center for Arts and Heritage or the Leeway Foundation. The Alliance keeps a schedule of ongoing events for professional development in arts and culture marketing. Research guides on data sources for arts organizations and arts audiences are compiled online from the Cultural Policy & the Arts National Data Archive (CPANDA). The world’s first interactive digital archive on data relevant to arts and cultural policy in the United States links you to sources like the Economic Census, the NEA Survey of Public Participation in the Arts, and data from arts service organizations like Theater Communications Group and the American Symphony Orchestra League. The Philadelphia-based Cultural Data Project (CDP) collects financial and programmatic information, enabling all arts and cultural organizations that submit data to generate management reports that benchmark against a profile of participating organizations. The CDP has expanded nationally to serve more than 14,000 arts organizations in 12 states and the District of Columbia. ArtsJournal blogger Matt Lehrman, the principal of Audience Avenue LLC who writes about audience building, pointed out that the U.S. doesn’t have a curated online library of high-quality and nonproprietary resources for arts marketing. In a June 2013 post, he issued a call for organizations that want this to get off the ground to get in touch with him personally. The U.K. is a step ahead in compiling case studies, research and articles on cultural marketing in an online searchable library with CultureHive, a site launched by Arts Council England and the U.K.’s Arts Marketing Association in 2013. 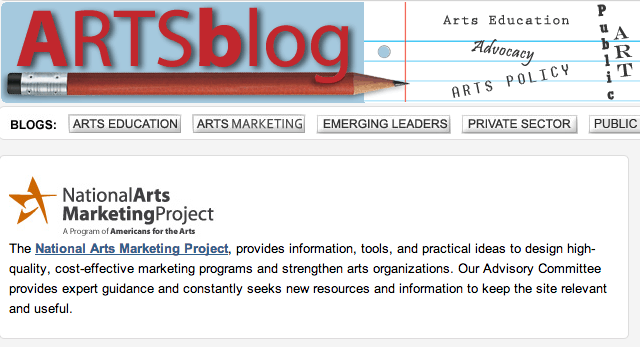 U.S. arts marketers will find applicable content through this search engine, as well. Beth’s Blog: Beth Kanter is the co-author of The Networked Nonprofit(2010) and Measuring the Networked Nonprofit (2012), and posts about social media and networked marketing for nonprofits on her blog. Nonprofit Marketing Guide: Author, trainer and consultant Kivi Leroux Miller calls herself a “do-it-yourself nonprofit marketer” who helps organizations work with limited marketing budgets. Nonprofit Tech for Good: Managed by Heather Mansfield, the site provides updates on nonprofit technology, online communications, and mobile and social fundraising. Getting Attention: Nancy Schwartz maintains her blog to help nonprofits succeed through effective marketing, posting case studies and how-to articles on audience research and content development. Frogloop: Allyson Kapin follows the latest trends in nonprofit communications, marketing, fundraising and technology. It’s also worth checking out the nonprofit news roundups curated for you by the Nonprofit Technology Network (NTEN) or the Nonprofit Blog Exchange. Check out this post from digital strategist Debra Askanase at Community Organizer 2.0.com that outlines the best options on curated nonprofit news. When it comes to arts nonprofit news roundups, Thomas Cott’s “You’ve Cott Mail” roundup of arts industry news and Douglas McLennan’s Arts Journal are also daily must-reads. Finally, stay on top of marketing news from outlets like Mashable, Ad Age, Tech Crunch, Fast Company, Hubspot Marketing Blog, Copyblogger, Media Bistro, Social Media Today, All Facebook Blog and The Chronicle of Philanthropy.